Other Products by Ghost Lifestyle. 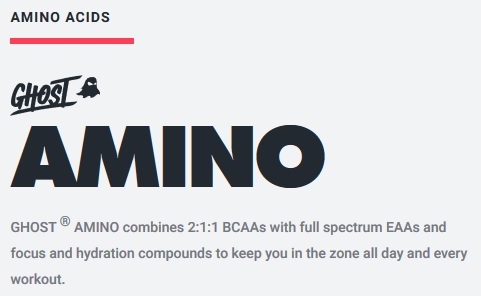 Search other Amino Acids products. Ghost Amino is a comprehensive bend of eight essential amino acids, conditionally essential amino acids, electrolytes and nootropics. Nootropics are becoming increasingly popular, perhaps as it is becoming increasingly apparent that we all at times have difficulty with focus, concentration and memory. Nootropics are natural nutrients that cross the blood brain barrier (BBB) and support neurotransmitters synthesis. Included in this formula is Alpha-Glyceryl Phosphoryl Choline, a novel choline containing molecule that passes through the BBB and delivers much needed choline for the production of a neurotransmitter called acetylcholine—an enhancer of focus or attention (1). 5-hydroxytryptophan (5-HTP) is, as the name suggests, an hydroxylated form of the amino acid tryptophan, and a direct precursor to the neurotransmitter serotonin. Interestingly, serotonin is then used by the pineal gland at night for the manufacture of melatonin, a natural antioxidant sleep molecule—but don’t worry, this product will not make you sleepy! 5-HTP passes through the BBB intact and supports serotonin production, which is important for a good mood and may also help to reduce emotional eating, which few could say would not be helpful. In summary, the 5-HTP and choline contained within make this product particularly helpful for focus and improving mood—not bad for an amino acid formula! 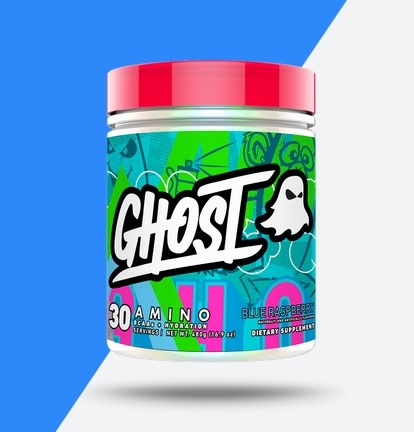 Ghost Amino by Ghost Lifestyle also contains organic raw coconut water powder, a natural source of electrolytes—particularly potassium, magnesium and sodium. These minerals are depleted whenever fluid is lost from the body, and therefore need to be restored. This helps to ensure coordination, mental focus and energy levels are maintained when exercising or performing other physical tasks. 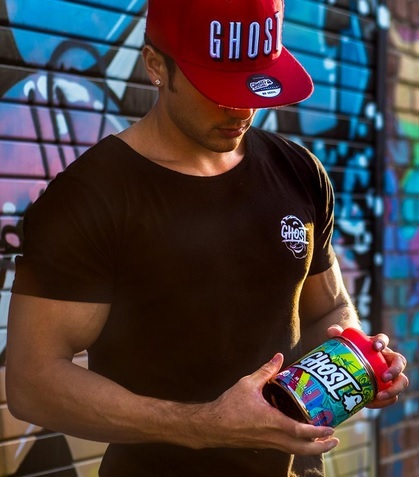 In addition to this, Ghost Amino contains all eight essential amino acids, needed for general health, exercise performance and recovery, containing higher amounts of the all-important branched chain amino acids (BCAAs). In addition to this, conditionally essential amino acids, such as Taurine and Citrulline, have been added to the formula, to assist with exercise performance and nitric oxide synthesis, respectively. The BCAAs, or Leucine, Isoleucine and Valine, help to energise muscle tissue by keeping blood glucose levels more stable. L-Leucine also stimulate mTOR, an important trigger of protein synthesis which aids in reducing delayed onset muscle soreness and helps with muscle tissue healing (2). All of the amino acids contained within this formula begin absorbing instantly after ingestion, by-passing the need for digestion. This is due to the fact, like any good amino acid formula, that they are not linked together by peptide bonds, but are instead in free-form. This powerful blend of ingredients comes in Fruit Punch and Blue Raspberry, and may be consumed during exercise or physical activity, or between meals for enhanced recovery. If you want a lift in mood, stamina, performance and recovery, this one is for you! OTHER INGREDIENTS: Natural and Artificial Flavour, Malic Acid, Citric Acid, Tartaric Acid, Silicon Dioxide, Calcium Silicate, Sucralose, FD&C Blue #1.